Here we cover topics – common collector configuration of the transistor – circuits, characteristics, applications, disadvantage, why it is called emitter-follower circuit? As we see in the previous article, there is basically three type of transistors connections. Common emitter connection, common base connection, and common collector. Amplifier circuit can be designed by any of this type of configurations but every configuration have some advantages and applications. We already cover CE and CB configuration in a previous article here we take a detailed article on CC configuration of the transistor. 1.3 why common collector is not used as an amplifier? 1.4 Where Common collector circuit is used? 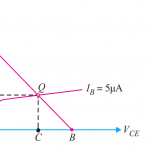 1.5 Why Common collector circuit is also called an emitter follower? In this type of configuration collector is common terminal between other both emitter and base terminals. Because of that, it called a common collector( CC) transistor. In our most practical life generally common emitter type transistor used mostly but in some applications this type of transistor also used. It mostly used for an impedance matching application due to their high input resistance. In this type of arrangement, an input is applied between base and collector and output is taken between emitter and collector terminals. You can note here for both input and output side collector terminal is common terminal. Below figure shows the common collector circuit for the transistor. Figure 1 shows a CC connection of PNP transistor and Figure 2 shows CC connection of NPN transistor. By the common collector, we can find the current amplification factor. 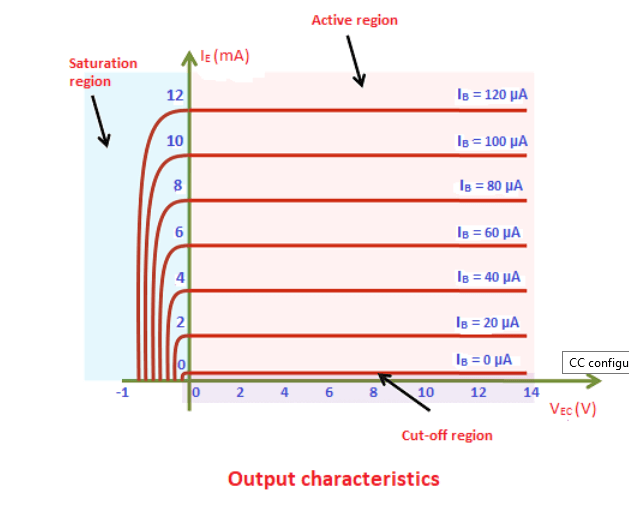 The current amplification factor is the ratio of change in emitter current ( Ie) to change in base current ( Ib ). This circuit provides same current gain as common emitter circuit. 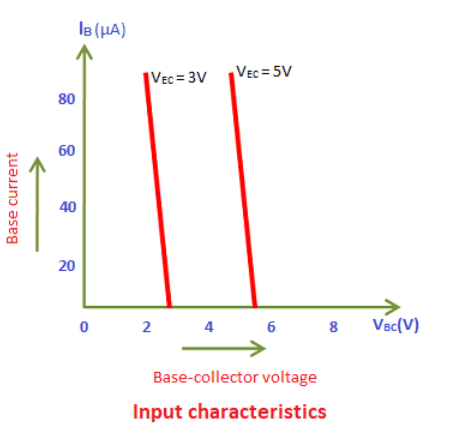 Input characteristics of common collector circuit is a curve between input current ( here base current = Ib ) and input voltage ( here base-collector voltage= Vcb ) at constant emitter-collector voltage ( Vec). Here base current Ib is shown in Y-axis. Base-current voltage Vcb is shown in X-axis. You can see the input characteristics of CC below. 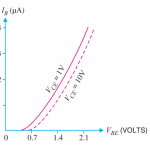 First here we take reading of base current (Ib) and base-collector voltage (Vbc) on constant Vec = 3 V. After that we take Vec= 5 V and take reading as same in previous reading. Output characteristics is a curve between output current ( here emitter current Ie) and output voltage ( emitter-collector voltage Vec ) at a constant base current Ib. Here emitter current Ie is shown on Y-axis. Emitter-collector voltage is shown on the X-axis. To determine output characteristics, we kept base current Ib constant and take readings. 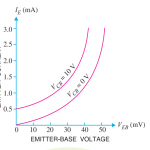 By taking constant Ib we increase Vec and note down emitter current ( Ie ). You can see output characteristics in the above figure. Here first we take a reading of Ie and Vec at a constant base current Ib =0 μA. After that, we repeat this process for higher different constant base voltage ( Ib = 20 μA, 40μA, 60μA, 80μA, 100μA ). In common collector circuit, if the input current is zero then output current is also zero. So, that there is no current flow in the transistor circuit. This region we can call as a cut-off region where Ib = 0 so that Ic is also zero. When the base current Ib increases collector current Ic also increases. This we can say that the transistor now falls into the active region. When base current is increased up to its limitation collector current also increase up to its last value. This region we can call as saturation region. why common collector is not used as an amplifier? Common collector circuit has a very high input impedance and very low output impedance so voltage gain provides by this type of circuit is less than 1. Because of that, this type of circuit is not that much suitable for amplification. For most cases, common emitter circuits are used for amplifying circuits because it provides high voltage gain as well as high current gain. CC connection provides high current gain but I think that’s not much enough to use CC in amplifying circuit. CC can’t able to provides high current gain for amplifying circuits. Because of this reasons we do not use common collector mostly. We also called this a disadvantage of common collector amplifier. Where Common collector circuit is used? As per we know common collector have high input resistance and low output resistance. Due to this reason this type of circuits especially used for impedance matching i.e. for driving low impedance load from high impedance source. Common collector circuit provides high voltage gain but this circuit is not able to give high current gain. It is used as a switching circuit in some application. This type of circuit is also used for circuit isolation. 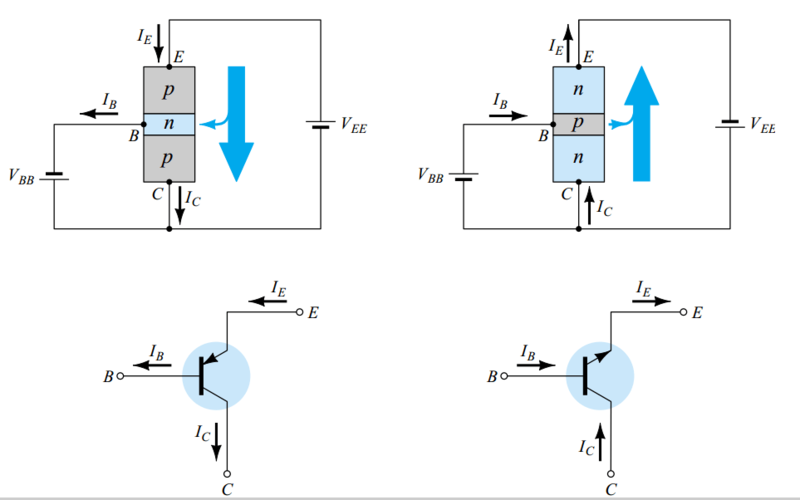 Why Common collector circuit is also called an emitter follower? In common collector circuit, as we know input terminal is base and output terminal is an emitter. In this connection output value always follows the input supply voltage. Emitter value is always nearly equal to base input supply value. Hence here emitter follows base voltage so it called emitter follower circuit also. In this type of circuits, base-emitter voltage is constant and value of this voltage is 0.7 V. So the conclusion is that emitter voltage is always nearly equal to base voltage hence it called emitter follower. In this configuration, the input current is base current ib and output current is emitter current Ic. In this type of configuration output current is the same as the input current. Means emitter current is same as base current because of that reason this configuration also called an emitter follower circuit. Common emitter circuit has high input resistance and low output resistance, due to these characteristics this circuit is mostly used in impedance matching applications. This configuration is able to give high voltage gain but not able to give current gain. Because of that reason in most application common emitter configuration is going to use.